Calibrate measurement object or VNA? One of the most important things to succeed with AnTune software is to do a correct S11 measurement calibration. Many even experienced antenna designers feel that antenna impedance matching is complicated due to that real world result often differs to much from what was calculated in the simulation software. There are a lot of small things that can be done to limit these problems. A very important part is to do a correct calibration for the actual measurement setup. Failing do this perfect, is one reason why designing matching networks goes wrong. 1. Connected cables should affect measured object as little as possible. 2. VNA is given maximum possibilities to do correct impedance measurements by compensating for cables connected to measured object for both impedance and time delay error. S11 calibration procedure is normally described very clear in the VNA manual as it is a vital thing to do to be able to get reliable vector readings. In most cases do these standard procedures work less good when measuring embedded antennas if not additional actions is taken. Every time a new antenna setup should be measured, every single piece of involved cables and other surrounding aspects must be calibrated for, before the antenna itself and matching network can be calculated/measured. Some VNA's do also need to be adjusted for correct electrical delay as that is not a part of impedance calibration procedure. Let's look at what factors that affects measurement results and what to do to better succeed with an antenna matching network. A common embedded antenna type in the range of 0.1-6 GHz is a monopole and ground is therefore from measurement view a part of the antenna. 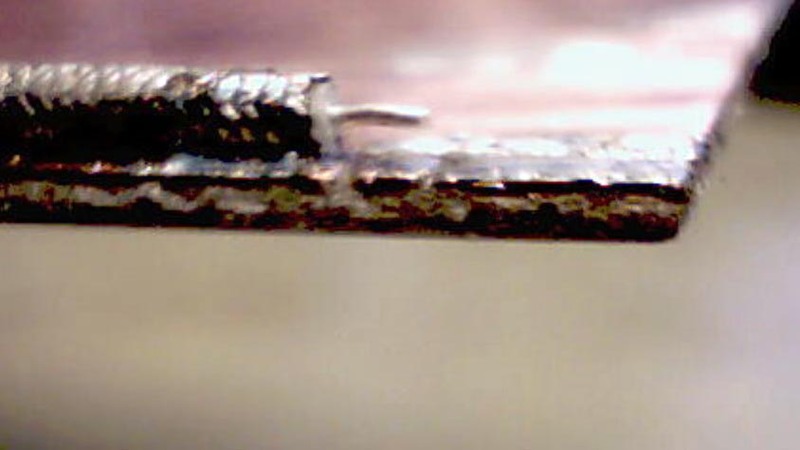 Typical is antenna placed at an end of a small PCB. Ground plane at this PCB is mainly its ground plane cupper pattern, but indirect everything else that also is in connection with PCB such as components, battery, display and cover. If the PCB is prepared for a matching network with SMD components, these cu traces and component pads also cause misreading if not compensated for. 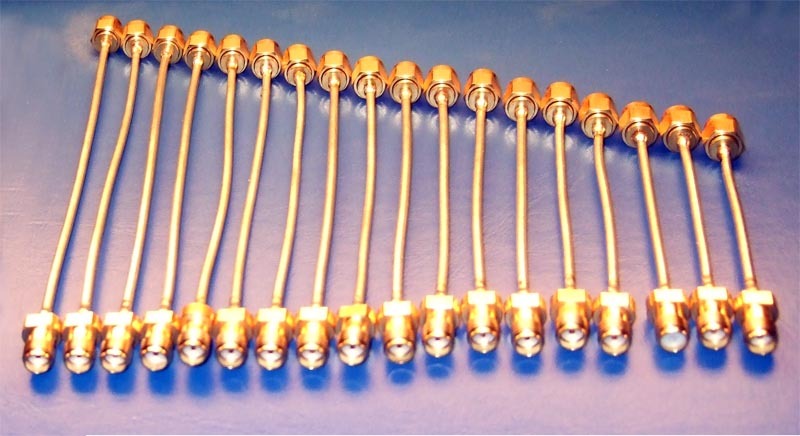 The coaxial cable that is temporarily connected at PCB for VNA measurement do also have effects on measurement results, and must therefore also be taken in account for best possible antenna function. 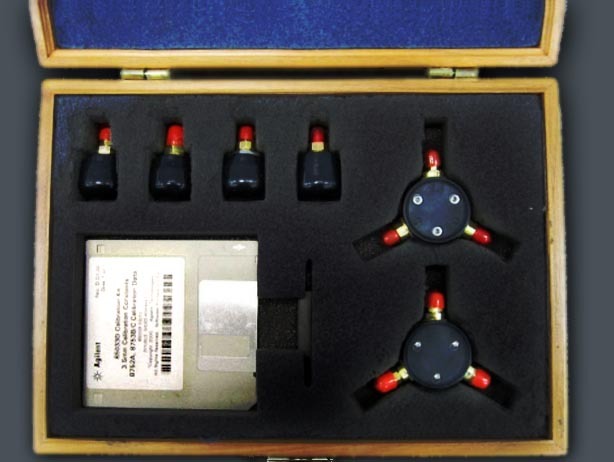 These photos show typical equipment that is used for measurement calibration. 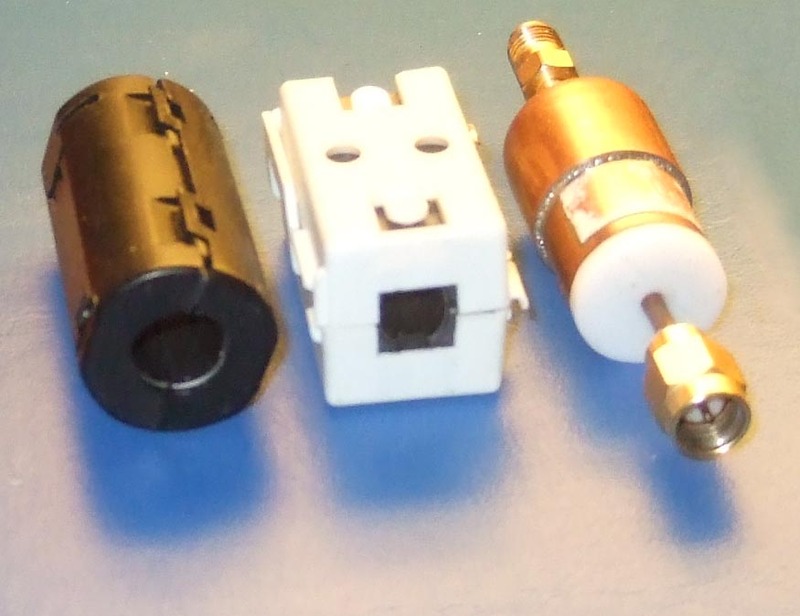 It is the round black calibrator equipped with three SMA connectors (open short load) that we will use, but many other types are common or even is a part of the VNA. Take good care of the calibration kit. A faulty calibration kit can cause more harm then a dead VNA. Read very valuable information about this at Microwaves 101. A collection of cables of same type as the measurement cable in several lengths, with SMA contacts in both end. Coaxial cables prepared with small ferrite tubes. These cables are of same type as the cable that is soldered on PCB. Bigger ferrites that can be split and attached around coaxial cables and quarter wave sleeves, as complement or replacement for ferrite. No picture but important when conventional calibration fails, are SMD resistors, 50 Ohm, for in place on PCB calibration. At VNA, select Smith chart view and then calibration menu. From here select correct calibration kit and S11 calibration. Start with verifying that a correct calibration of the cables that will be used as a part of the final measurement setup is achievable. Select a coaxial cable, from your cable collection, that have same length and type as the cable that is intended to be soldered on the PCB. The idea of having same type of cable and length is that it results in same impedance characteristic and electrical delay. Connect this cable to your low loss coaxial cable which is connected to VNA and in the other end connect the standard calibration kit function "open". Adjust manually electrical delay at VNA until it shows a single point most to the right in Smith diagram and then perform standard S11 calibration procedure. If needed repeat delay adjustment for open and verify that this setting also is correct for short. If you don't succeed to get the correct electrical delay for both open and short is probably something faulty or wrong type of calibration kit selected. Correct this before next step. For the test cable that should be soldered to the PCB, the length that is sticking outside of PCB must be filled with ferrite tubes to avoid ground current on cable shield. Neither using ferrite nor sleeves will result in that test cable will be an part of total antenna/ground. Measurements can still be done but when cable later is removed, will antenna function change according to the new, shorter ground plane. 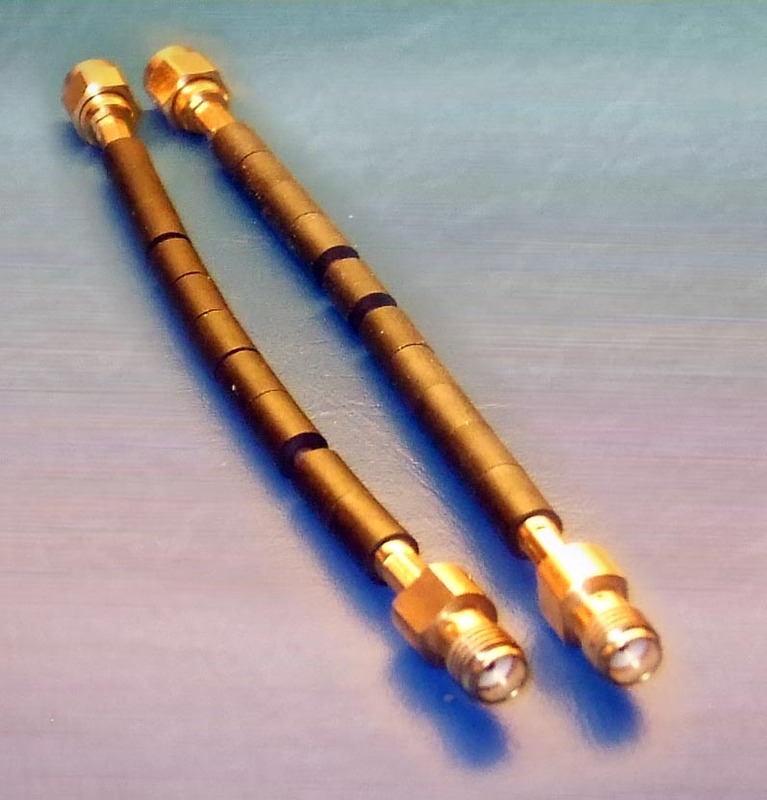 Also use clamp ferrites on the low loss coaxial cable connected to the VNA for improved measurement results. Prepare to connect coaxial cable center wire to the measurement pad by removing a few mm of outer wire and isolation. Do not solder wire to any pad yet! Now solder the test cable braid on PCB at several points for good grounding. Soldering points must have low RF losses. Do not route cable via the short end of PCB as it then extends ground plane size. This is a PCB that have been reused several times. Coaxial cable will have minimal impact on ground plane with this placement. Observe ferrites. If the connection point at PCB for center wire also is connected to something backward, such as a radio chip, a balun or just traces, cut of this trace temporarily as it will affects measurement results. Cable is now ready to be checked as "open". Coaxial cable center wire is hanging in free air for a few mm. Now adjust electrical delay again with unconnected center wire. Observe that this calibration can be done in AnTune. Then check that electrical delay also is correct for short by bending it like a U and sold the tip of center wire to cable shield. If measurement point also involves PCB transmission lines that must be compensated for, is inplace calibration needed..Calibrate short, open and load. Load is achieved by soldering a 50 Ohm SMD resistor between reference pad and ground. If PCB have an unstable RF ground at measurement point can that result in very unreliable measurements. If possible is it a good idea to have this type of calibration defined in VNA as a special defined calibration kit. The setup belonging to a standard calibration kit does often have special parameters for internal capacitive losses and delays which not is useable when doing in place calibration. How to do custom cal.kit setup can normally be found in the VNA manual. When doing in place calibration, the coaxial center wire should not be connected against any PCB trace. Even if it is an unpopulated trace is it a part of the load that we later should optimize, not a part of the calibration load. In the ideal case we now expect to read a well defined infinite impedance at Smith diagram in the VNA for open wire and reading 0 Ohm impedance for short. It will never be perfect but how much error that can be accepted depends on how well you want to succeed with the matching network. For a well calibrated measurement point, the resolution of VNA is now the limit of how precise a correct value of a matching network can be calculated. This calibration procedure is not much more complicated than normal calibration when it has been practiced a few times. 1. High Q requires very ideal surrounding. 2. High Q requires low loss components with small component tolerances if you want to hit correct frequency. Matching with very small serial capacitors or small values of parallel inductors are also tricky and can cause unwanted losses that reduce total antenna efficiency. What are small values? Depends on for what frequency the matching network is intended to work and how good designed the PCB is. Typical numbers at 1-2 GHz: small values are 1-2 pF and less than 5 nH but exceptions are allowed. Upper limit of component values to avoid for the same frequency range: 100 pF, 100 nH can be omitted without affecting matching network performance as they mostly represent a shortcut or an open circuit. As a rule of thumbs, assume each component to add losses corresponding to 0.2 dB. If a component don't adds benefits higher than that is it better to use a shorter network. A short network is much easier to succeed with as number of error parameters becomes much less. Do not forget to check component data sheet if at least the inductors are useable over whole intended frequency range. Trace length causes serial inductance, stray capacitance and time delay. Probably the worst problem is when the ground plane that is used as ground for matching components/antenna not is RF stable. Make it as a habit to optical investigate how PCB layout looks. If RF ground consists of several isles or partly is interconnected with small traces or vias, that are clear warning signs. A typical matching network consist of a few components placed at different distances from you calibrated point. The calibration that you have done was only correct for one specific point. A few mm PCB trace length added can easily correspond to a few nH serial inductance or a stray capacitance, besides the time delay it adds. For low frequencies this time delay maybe cause minor error but say at 2.4 GHz, 5 mm trace length with wave speed 0.6*c cause a time delay which easily can result in that a capacitor becomes a coil. Short traces, including length to reach good ground makes things much simpler. Each added component in a network increases the complexity to reach intended goal with square sum of number of components or worse. Spending some extra time with adjusting antenna shape can save time if it makes you able to select a simpler/shorter network solution. All these "avoids" have exceptions and grades depending on actual measurement object and most important, what your experience allows. A very simple way to avoid that simulated and real network differ or not behaves as expected is to never solder whole matching circuit without checking each step. When all components have been soldered is it complicated to correct errors as it is hard to point at which component that shoulod be adjusted. Instead, solder one component at the time and verify for each component by measuring that assumed impedance curve is met. In AnTune software is it easy to manually configure remaining network in step by step for each component as a single virtual components in a matching network can be disabled in AnTune when replaced with real components, and it is possible to switch between before/after curves to verify that correct result is achived. Best is this done by compare with previously saved, expected curve, with resulting measured curve for the partly finished network for each step. It can then easy be found if component values need to be adjusted in any direction and amount of adjustment can directly be read by adjusting the simulated part of network manually until you are back on the expected curve. This iteration is especially important if the antenna is very mistuned from start as antenna efficiency changes a lot during matching procedure, and RF radiation and RF currrent in ground plane can cause coupling effects. Typical antenna types that changes a lot in behaviour from unmatched to matched is PIFA antennas with ground and RF feed very close to each other and small loop antennas, as by antenna emitted/received energy changes a lot from untuned to tuned. As result of the improved tuning will the antenna system load increase during development of the tuning circuit. Do save curves and other results often, both in program memory and to disk. It is your way to undo steps if something goes wrong and finally verify when the goal is met. Bad soldering skills is too often a source to bad matching results. Too much solder (risk for partly shortcuts, increased capacitive losses), too much half burnt dust and dirt (capacitive and resistive coupling) do cause measurement result that will not exist in machine soldered final product. Cold soldering and metal oxide also results in error. 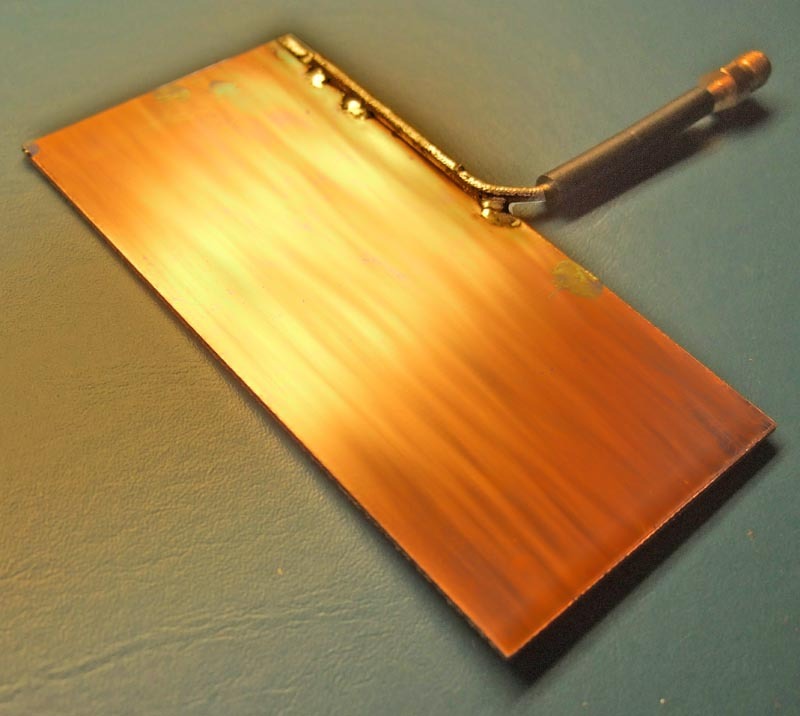 It is not too much to require that professional engineers know the value of a clean oxidation free PCB. Use good tools and a clean soldering tip set at correct temperature, which is way below tin sputtering at 400C or even higher temperatures. Soldering tool in good order does make the solder work much easier and reduce the risk that matching is performed with half burnt components. Not less important is that your customer will judge the quality of your work more by looking at the soldering, as it is that level they understand,. Effort you spent on the component values role for reaching antenna function goal is best showed by good documentation. If all above steps are correct done, do not expect perfect fit between virtual and real matching network. To set perspective on result, if VSWR is +/- 20% from goal in a network involving 3 components, that is good enough. Do also take in account that all three component values have tolerances that can cooperate in unwanted direction. Spend that time in AnTune and adjust values for worst case. For further improvements when you succeed with antenna and matching network, do a final check of antenna shape which in combination with actual matching network can result in previously unseen possibilities to do minor improvement. Almost always do that final check results in minor improvements. A lot of text for something that at least in each part is relatively basic but to cover all possible things that can go wrong, a lot of more text had been needed as I have long experience in "what can go wrong". AnTune gives you better control, if something not is correlating between what calculated and measured values. It is immediately indicated, for each component, giving a chance to correct this in a simple way. Besides getting better control of designing process of both antenna and network AnTune does give you a simple tool to do a lot of "think if" and a freedom to do previously unthinkable antennas. Do that, dare to experiment, best mistakes are those that you make yourself and afterwards learn from. It can also result in a new type of antenna solution, as they often are results of mistakes.